In my last article, I showed the precision power of Photoshop CS5’s new Puppet Warp on photos. Well, Puppet Warp can also be used on text and shapes as long as they are converted to Smart Objects. 1. Start with any font. For this example, I am using one of Adobe’s standard fonts, Garamond Pro – Italic. 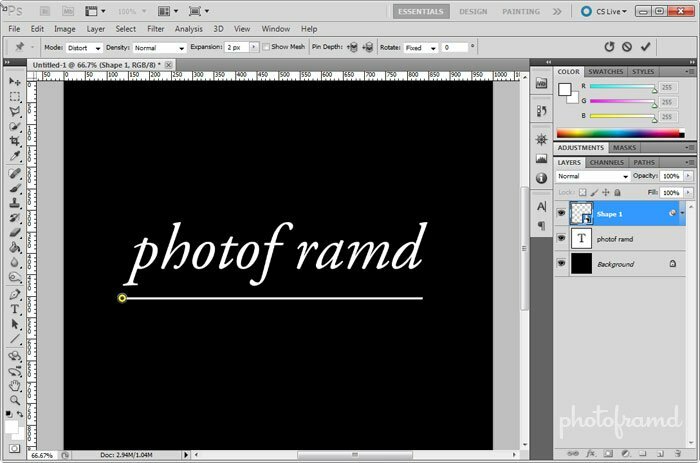 I intentionally added a space between the F and the R because Photoshop automatically substituted those two letters for a glyph. 2. Use the Line Tool to draw a 5 point line. I used the standard Line Tool to draw a single 5 point line. 3. Convert the Line to a Smart Object. In order to use the Puppet Warp on the Line while keeping it a vector path, you must convert the Line to a Smart Object. Click on the Line layer and right click to select Convert to Smart Object. 4. Puppet Warp Mode and Rotate settings. Puppet Warp is located under the Edit Menu. I placed the first pin at one end of the Line. This time, I selected Distort from the Mode drop-down menu above the image area. Also, with the first point, I selected Fixed from the Rotate drop-down. 5. Use Alt/Option to Rotate a Pin. I added another pin and the end of the line, also set for Fixed and Distort. The middle pin is different, that one is set to the standard Normal and Auto settings. With the middle pin selected, I held down the Alt/Option key to activate the Pin rotate tool. Just a simple turn will now create an elegant curve. With the Move Tool selected, I held down the Alt/Option Tool and dragged to create a duplicate of the curved line. The double lines will act as an optical container for the text. 7. Convert the Text layer to a Smart Object and apply the Puppet Warp. 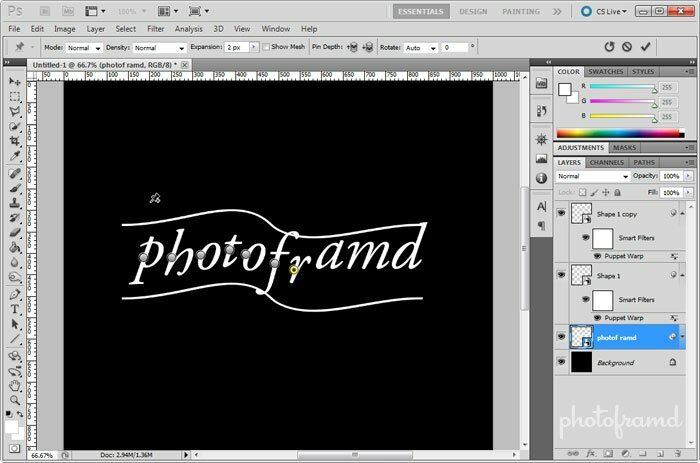 Text is another vector path in Photoshop. Click on the Text layer and right click to select Convert to Smart Object. Now, apply the Puppet Warp under the Edit Menu and start placing pins. You will notice that Text acts differently in Puppet Warp than other objects. By placing a pin, you can actually move a letter without altering it. I simply started moving the letters to follow the path of the curved lines. 8. Stretching Letter by adding multiple pins. It would look nice to have the letter F ascend and descend the curved lines. I added additional pins near the top and bottom of the F. After trying to Puppet Warp the F, I noticed the median crossbar to the F was distorting. I added another pin with the setting Fixed to hold the line straight. With all the letters in place, I thought it would look more balanced to have the letter M angled slightly to follow the curved line below. Now, I just moved the remaining letters to complete. As I said before, the Puppet Warp is a powerful precision manipulation tool. As long as you convert the Layer to a Smart Object, there is no limit to it’s use.